My husband and I have always strived to bring our children up in an atmosphere of mutual respect. Our marriage is a partnership based on trust, love, and collaboration. We value both our children equally and have high aspirations for their success in life. When I’ve seen our son interacting with women, he’s always kind and respectful. I want our daughter’s experiences with men to be universally positive. I want her to be valued. We don’t live in a bubble and we can’t shield them entirely from the goings on in the world. With so much in the news and the air now about sexual harassment and violation of both men and women based on their gender, our job is to both teach them how to behave honorably as well as how to recognize if they are being treated otherwise. We need to teach them what to do about it. I don’t want them to have some of the experiences I’ve had. When I was in my mid-twenties and beginning my professional career, sexual harassment was not part of the vernacular of the workplace. We didn’t wear those lenses, and I regret I didn’t see certain incidents for what they were—like the time I was told I was too pretty to promote by my male boss. I felt powerless to do anything about the situation. Nowadays I’d like to think that employers can’t get away with these things, but surely they do. But the more people speak up and support one another, the sooner this vile part of our culture will dissipate. I want my children to know they have the power to make things better in their generation and for their children. Be alert to it. Nurture it. Create it. There’s always the possibility, as well, to find sweetness in places and situations you’ve never considered before. 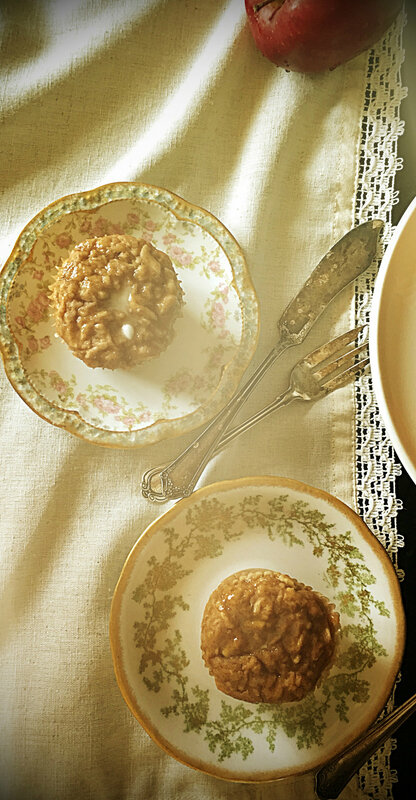 These Parsnip Muffins with Apple Cider Glaze are a good example. I’ve always thought of parsnips as an ingredient to savory dishes, but I came across a recipe for a parsnip cake by Izzy Hossack of Top with Cinnamon. Topped with a cream cheese frosting, her recipe looks divine, but I wanted something a little lighter for breakfast so I created muffins instead. The grated parsnips in the batter become both sweet and moist as they bake. Topped with an apple cider glaze, they are a light and delicious way to start the day. Try them with a cup of hot coffee and a bowl of fresh fruit. Enjoy. In a large bowl, beat together the brown sugar, eggs, olive oil, buttermilk and vanilla extract. In a separate bowl, sift together the flours, salt, baking powder and baking soda. Fold the dry ingredients into the wet. Add the grated parsnips and ginger. Stir to combine. Place in oven and bake until puffed and golden, about 35 minutes. While the muffins are cooling, prepare the glaze by stirring together the powdered sugar and apple cider. Pour evenly over the cooled muffins. This recipe was inspired by a recipe for Parsnip Cake with Cream Cheese Glaze by Izzy Hossak of Top With Cinnamon.